m.Revvs.net is a new motorsports mobile web site which presents excepts (typically the first paragraph of a longer story) pulled from news sources around the world. Each story is illustrated with a 128x128px image. There’s a lot of news on this site, with around 60 news items appearing on the site at any time, probably more than any other mobile motorsports site. Revvs covers all areas of the sport with dedicated sections for F1, MotoGP and NASCAR and an “Other Stores” section with items on A1GP, SP2, WRC British Superbikes, etc. Page size is low, about 2KB of text and 10KB of images per page ensuring compatibility with virtually any web capable phone. The only problem I have with Revvs is that the stories are excerpts and to read the full story you need to click on the “Source” links at the bottom of each page – which link directly to full web versions of the story. The linked pages are almost always too large to load on a typical feature phone – which seems to be the market segment Revvs is targeting. Even trying to load them could cause a nasty billing shock for users on metered data plans. Revvs needs to offer the option to open external links in a transcoder such as Google’s GWT. Google is apparently OK with 3rd party sites linking through their transcoder, even high volume sites like Taptu are doing it. It does need to be optional though. I use a simple interstitial page on wapreview.mobi that offers users a choice of several transcoders or no transcoding at all. The choice of transcoders is probably overkill but the option to not transcode is essential as transcoders pretty much destroy the browsing experience for users with full web mobile browsers like Opera Mini. 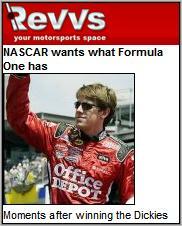 This entry was posted in Motorsports and tagged F1, mobile site review, MotoGP, NASCAR by Dennis Bournique. Bookmark the permalink.